Callan, Scott J.; Thomas, Janet M.
Provides an applied, practical approach to environmental economic theory that is accessible to students who have had minimal exposure to economics as well as those with an advanced understanding. 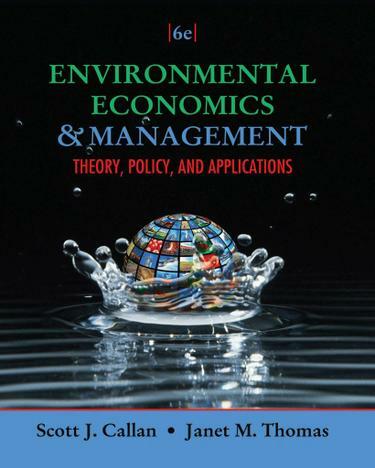 With a strong focus on policy and real-world issues, Callan/Thomas's ENVIRONMENTAL ECONOMICS AND MANAGEMENT: THEORY, POLICY AND APPLICATIONS, Fifth Edition, complements economic theory with timely, real-world applications. Undergraduate or MBA students gain a clear perspective of the relationship between market activity and the environment. This text integrates a strong business perspective into the development of environmental decision making for a unique vantage point often overlooked in more conventional approaches. Students learn to use economic analytical tools, such as market models, benefit-cost analysis, and risk analysis, effectively to assess environmental problems and to evaluate policy solutions. With a proven, modular structure, this edition provides a well-organized presentation with the flexibility to tailor the presentation to your needs.